If you’re an avid Disneyland-goer like me, you may have heard about the Gibson Girl Fantasia ice cream! It’s a scoop of cherry, pistachio, and banana ice creams in one dish. I decided to make a vegan, gluten-free copycat version of the ice cream! You can either have it in a dish, or have it in a gluten-free, chocolate-dipped cone like I did, to add some extra magic! Pistachio Ice Cream: 1 can of refrigerated coconut cream, 1/4 cup maple syrup, 1 1/5 tsp matcha green tea powder, and shelled pistachios. For ice cream cones, I like to use Goldbaum’s Gluten-free, since you can conveniently find them at Target here. Mix together cherry ice cream ingredients in a blender, and pour into a freezer-safe container. Mix together banana ice cream ingredients in a blender, and pour into a freezer-safe container. Mix together pistachio ice cream ingredients in a blender (minus the pistachios), and pour into a freezer-safe container. Then add in pistachios and stir in. Place all ice creams in the freezer overnight. Place 1/3 cup cocoa nibs and your Tbsp of melted coconut oil and mix together, microwaving for 30 seconds. Stir, and microwave an additional 20-30 seconds as needed. Pour chocolate on parchment paper, and roll your cones in it. 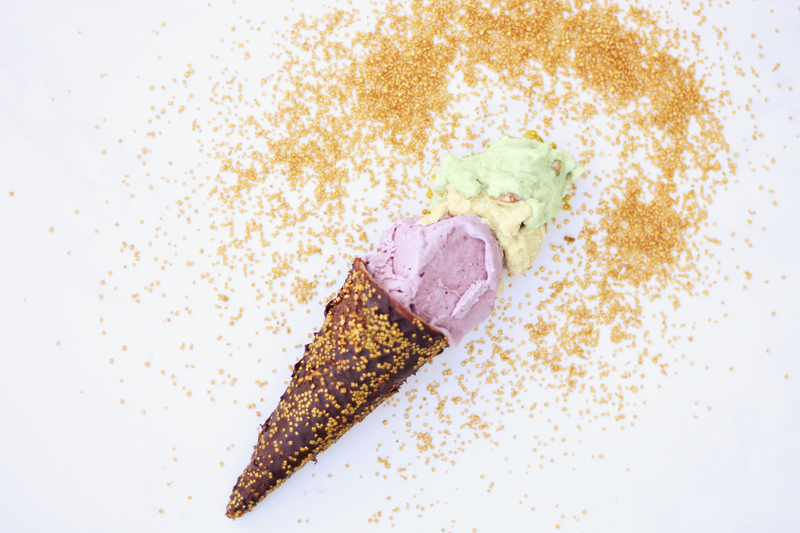 Then, roll your cones through sprinkles. Place cones on a plate, and stick in the refrigerator to harden the chocolate. When ready to eat, let your ice cream thaw for 20-30 minutes, and scoop + enjoy! Enjoy this vegan and gluten-free healthier take on Disneyland’s Fantasia Ice Cream, complete with magical chocolatey cone!